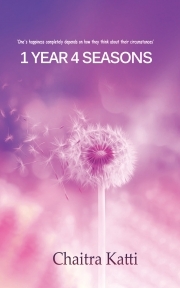 Description of "1 Year 4 Seasons"
Disturbed by turbulent life and unfavourable perceptions of the world, a girl in her late twenties goes in search of meaning for her life. While she travels to different places, she learns to travel within, and finds how important every situation in life is, to find one’s destiny. She learns to understand every message of universe and interprets them with the help of law of nature. She thanks her solitary, turbulent life, from which she learns the connection of oneself with nature’s laws. She distinguishes between false thoughts and the real destiny of life and discards the idea of success created by world. Her understanding about worldly pleasure, changes from material possessions to inner abundance, which helps her to satisfy her soul. A collection of normal life incidents that helps the reader understand how to interpret the nature’s messages in every day’s life and walk the road to divinity. A Nomad who has learnt the magical secrets from the monks and shares the life's precious messages. Reviews of "1 Year 4 Seasons"